The 2018 state competition was held at ASU West on March 9 and 10, 2018. There were 40 teams that qualified for the competition. 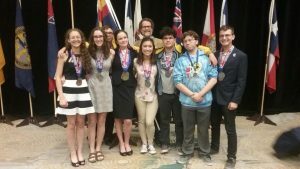 Canyon del Oro High School from Tucson Amphitheater district took the state championship with 47,303 points. The other teams that made the top ten were: Hamilton (Chandler)45,129; Mountain View (Mesa) with 44,808 ;Westwood (Mesa)44,715; Cesar Chavez (Phx Union) 43,883; Skyline (Mesa) 42,009; Seton Catholic 40,734; Basis Peoria 38,801; Basis Chandler 37,855, and Red Mountain (Mesa) 37,653. Rookie of the Year Trophy was awarded to Basis Scottsdale and the Most Improved Trophy was awarded to Skyline High School. The Super Quiz Team awards went to first place Cesar Chavez, Canyon del Oro, in second place and third place was Mountain View Mesa.